Just in time for the Holidays!!! A unique and local gift. 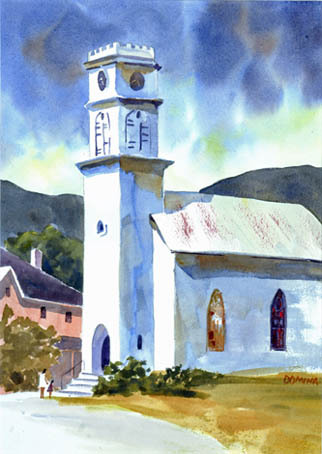 The Montgomery Historical Society is excited to offer for purchase, beautiful Limited Edition prints of Pratt Hall from the original water color (above) by Montgomery artist Michael Domina. There will be just 100 of these 10 X 14 giclees produced in cooperation with Michael, and they will be numbered and signed by him. The prints can be purchased now for $50.00, $35.00 each. Postage and shipping, if required, will be $5.00 additional. Order and pay via our website using your credit card or Paypal account. If local, you can call any Board member (click the Directors link above) and drop off a completed form and check with any of them. Thanks to Michael Domina for sharing his talent with us and thanks to you for your support.